Graphic Design changed my life! This is a bit of strange request, but next week I am getting a tattoo which is inspired by your work! 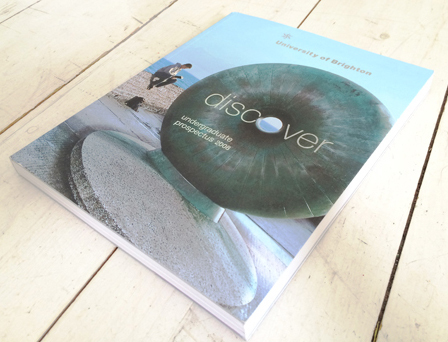 I went to Brighton Uni in 2008, and the one of the first things that attracted me to the place was the picture on the front of the prospectus of the sculpture ‘Afloat’ on the seafront that you used, and next week I’m getting a tattoo of the sculpture to represent my time in the city. I was just wondering, do you have the photo you used? Or even a clear picture of the prospectus, there is only half a picture on your website. It would be a great help if you had any pictures that could help, the front cover actually changed my life, choosing the Brighton was the best decision I ever made, so to get some help from you for my tattoo seems perfect!